The rabies virus can infect any warm-blooded animal, including humans. It causes a disease of the nervous system often manifested by changes in behavior followed by paralysis and death. The principal reservoirs of rabies in the United States are skunks, raccoons, bats, and foxes. Bats and skunks may shed (secrete) rabies virus in their saliva without exhibiting behavior that would arouse suspicion of infection. Any wild animal that allows you to get close enough to handle it should certainly be suspected of rabies and left alone. 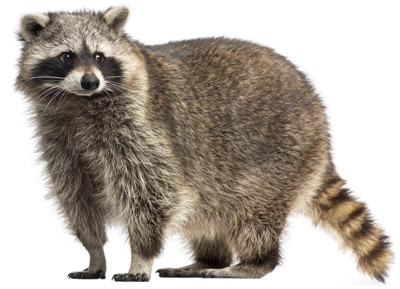 Dogs should be supervised when outdoors to prevent exposure to rabid wildlife, especially during the night. Rabies is usually spread when one rabid animal bites another, depositing virus from its saliva into the bite wound. However, rabies virus can enter the body through any break in the skin, through the mucous membranes of the mouth, and probably of the nose and eyes as well. After entering the body, rabies virus becomes "fixed’’ to nervous tissue, where it multiplies. Signs of rabies usually begin between about two to ten weeks following infection, but cases have developed after more than one year from contact. Rabid dogs usually first show changes in temperament. At this time rabies can be particularly difficult to diagnose because the signs are so variable. A dog may become restless, insecure, or apprehensive, overly affectionate, or shy. Some dogs snap at imaginary objects. Some dogs have a normal appetite; others have to be coaxed to eat. Some dogs are febrile and have dilated pupils. Following these early signs, a dog may become particularly restless, wandering long distances while biting and snapping at any moving object. This is often referred to as the furious form of rabies. These animals become insensible to pain and, if confined, may bite or slash at the bars of their cages. Partial paralysis of the vocal cords results in a change in the voice. Convulsions may be seen and may cause death. The dumb form of rabies may follow the furious form or may be seen by itself. It is characterized mainly by paralysis. The dog’s mouth often hangs open, and saliva drips from it. Since such dogs cannot ingest food or water, they become dehydrated. Eventually, total paralysis followed by death occurs. Recovery from rabies is so extremely rare that animals suspected of being infected are usually euthanized and tested for infection after death. Protect your dog from rabies so you will never have to deal with the problem of owning a rabid animal. Dogs should first be vaccinated against rabies when they are three to four months of age. There are several types of vaccine available. The most commonly used types are inactivated virus. The vaccine is administered by intramuscular (in the muscle) injection into one of the hindlegs or subcutaneously (under the skin), usually near the shoulder blades. Protection against rabies is reached within one month after primary immunization. Vaccination against rabies is required by state law, and the same law regulates the frequency of booster vaccination as well. The current recommendations of the Centers for Disease Control vary with the type of vaccine administered. In general, a booster shot is given one year following the original vaccination, then booster doses are given every one to three years depending on the product used. If you or your dog is exposed to a rabies suspect, that animal should be confined if possible and turned over to a public health officer for rabies quarantine or euthanasia. All bite wounds should be thoroughly washed with large quantities of soap and water and flushed with 70% ethyl alcohol, which kills rabies virus. Whether or not your dog will be quarantined following exposure to a rabies suspect will depend on state and local regulations. However, it is recommended that exposed, currently vaccinated dogs be revaccinated immediately and confined for observation for ninety days. Pseudorabies, a herpesvirus-induced disease of swine that is fatal when transmitted to dogs or cats, may be confused with rabies infection. Although aggressive behavior has not been reported, the fever, lack of appetite, restlessness, drooling, and self-mutilation that often accompany this disease can look similar to signs of rabies. Since no treatment is successful, the affected animals must be euthanized. Prevent this infection by not feeding your dog raw pork. Reproduced by permission from The Well Dog Book by Terri McGinnis, D.V.M. © 1974, 1991 by Terri McGinnis, D.V.M. All rights reserved. Published by Random House, Inc., New York.